Learn the right way to pursue a satisfying career using proven step-by-step program! 144-Pages - Only $9.95 - Download NOW! CAREEREALISM.com's Founder, J.T. O’Donnell is a nationally syndicated career expert and workplace consultant who helps American workers of all ages find greater professional satisfaction. Unlike other advisors, O’Donnell is a true “field expert.” She works with both individual clients and corporations, giving her access to emerging workforce trends. A graduate of Tufts University, she has 18+ years of experience, managing, training and coaching people of all ages on a wide variety of career topics. O'Donnell's work has been cited in Wall Street Journal, USA Today, New York Times, The Boston Globe, CNN.com, MSNBC.com, AOL.com, CareerBuilder.com, BusinessWeek.com, Mashable.com, Yahoo.com and dozens of other national publications. Her book, CAREEREALISM: The Smart Approach to a Satisfying Career, outlines her highly successful career-coaching methodology. In 2007 she joined Dale Dauten to write the career advice column "JT& Dale Talk Jobs," a nationally syndicated column that appears in more than 130 newspapers, reaching 6+ million households weekly. And most recently, in 2009, O'Donnell founded CareerHMO.com! 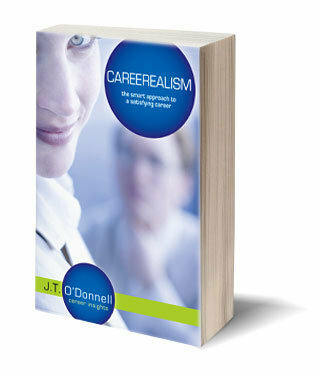 Purchase the e-book of CAREEREALISM for only $9.95 by clicking here » and you'll automatically receive a downloadable copy via e-mail. FREE first-class shipping included! You'll get the book within 3-5 business days!